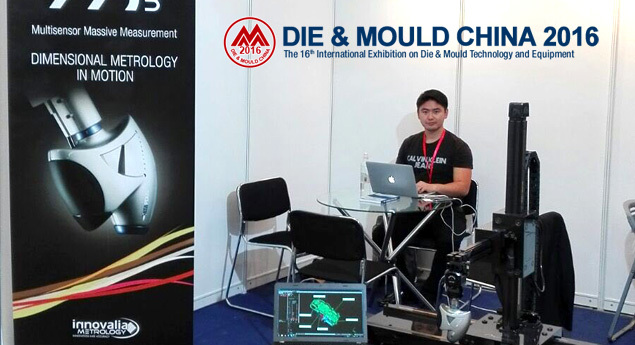 After the end of the International Exhibition on Die and Mould (DMC) in China, Innovalia Metrology takes stock of their participation in the event. This annual event in the Chinese mould industry co-organized by the China Die & Mould Industry Association and Shanghai International Exhibition Co., Ltd., have been held from June 28 to July 1, 2016 at the Shanghai New International Expo Center. Located in Hall 4 and from our booth B290, the 70,000+ square-meter exhibition were the key to focus our products to the development, growth and technological achievements of the Chinese mould industry. Against a backdrop of increasing cooperation in production at a global scale and the cross-integration of manufacturing technologies, DMC has played an important role in facilitating technology exchanges, economic and trade cooperation, market expansion and growth in exports for the companies in the sector. The molds, which are necessary for the manufacture of cast metal or plastic components, must comply with specific tolerances. To keep these parts within the relevant tolerances, in order to promote the transformation and technological change, we presented our hybrid solutions (M3 Hybrid) in DMC supported in a measurement system with a much higher speed and reliability when making a three-dimensional measurement. With a focus on continuous optimization and improvement, our hybrid platform is defined by the new features of refinement, automation, digitalization, integration, networking and intelligence. This technology combines the classical technique of touch probe measurements with the new high-tech Optiscan optical sensor. What we get with this new method is a much higher speed and reliability when making a three-dimensional measurement. We get those difficult to access points through our touch sensor system and with the Optiscan optical sensor we are able to scan the rest of the piece. This unique hybrid design allows the integration into any system for both laboratory and in-line manufacturing with high precision and speed. The booth of Innovalia Metrology also presented the M3 portable, equipped with M3 platform (Multisensor Massive Measurement), perfect to optimize the measurement processes in a natural and efficient way. It is a much more compact machine and integrates all technologies in a portable and easy environment to be moved around the plant. The exclusive and innovative design of M3 portable combines a positioning and scanning system fully automatic with the automatic sensor Optiscan, getting together in a single product the advantages of the high quality of optical scanning with a design based on new light and extremely rigid composites.